Simplify the way you create your favourite Dutch oven dinners. The Dutch Oven Lid Lifter is easy to use and easy to handle making it the perfect tool for lifting a cast iron lid full of hot coals. This lid lifter is 14 inch long making it the perfect aid when Dutch oven cooking. 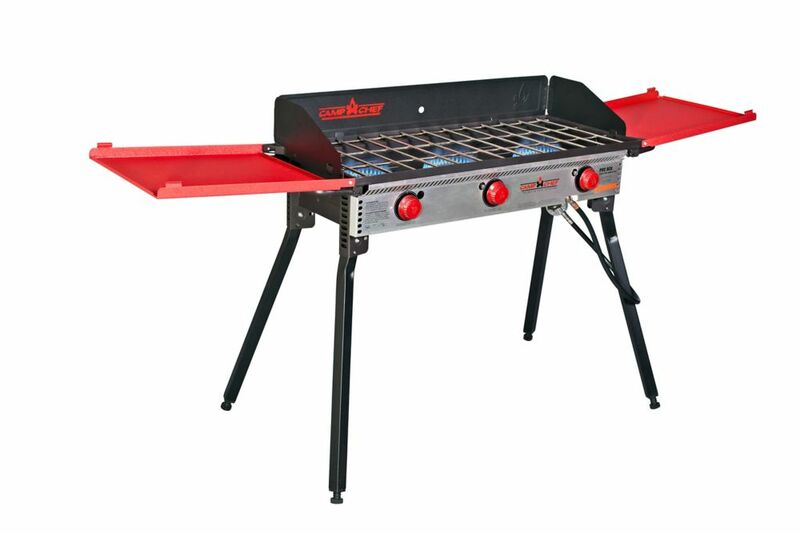 Deluxe Three Burner Stove For over 25 years, the Pro 90 has set the standard for outdoor cooking. Now, with a brand new design, our Pro 90X is raising the bar. Three powerful 30,000 BTU burners give you the cooking power and surface area to whip up food for even the biggest cookouts. You can use multiple 16 inch accessories at once: a pizza oven on one side with a griddle on the other, a Dutch oven on the right and a BBQ box on the leftthe possibilities are endless. A threesided windscreen and matchless ignition make it easy to cook on the Pro 90X wherever you are, whether that's the campsite or the tailgate party. Plus, newly designed features like folding side shelves, builtin leg levellers, and easy folding legs make your cooking experience smoother and easier than any other stove on the market. You'll wonder how you ever cooked on anything else. Get yourself the Pro 90X today. Deluxe Three Burner Stove is rated 5.0 out of 5 by 9. Rated 5 out of 5 by MikeEH from So Versatile I love this unit, it's so versatile with all the accessories, my favorite being the two burner flat top and grill box. I have taken this thing on many trips and cook at home with it all the time, it has replaced my old BBQ for my go to grilling machine. Rated 5 out of 5 by Tomyo from Perfect addition to our camping trips Love this Camp Chef Pro 90x. Used it for the first time on a beach camping trip to Destin. Cooked for the entire crew, the griddle was great, from steak sandwiches to fried potatoes. Rated 5 out of 5 by Camper1 from Camp Chef Pro 90X This is my second Camp Chef, using both. Stove works good. I would recommend this Stove.